Limcan Certified installs donation of Lennox Furnace in support of the Rotary Club of Whitby Sunrise. Today the folks at LIMCAN CERTIFIED were installing the Lennox Furnace at the home of the Live Auction Winner from the Rotary Club of Whitby Sunrise's Savour the Flavour fundraising event. Here is Charles Bridle, Club President and Sarkis Harmandayan, Club Member with Steve Storey, General Manager of LIMCAN CERTIFIED. This is the 4th year that LIMCAN CERTIFIED has sponsored the Savour the Flavour Event. A good news post to wrap up 2018! 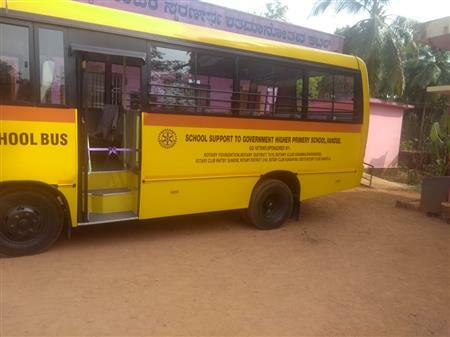 The Rotary Club of Whitby Sunrise participated in a matching grant project in India. Our funds went to providing better access to education for Vandse children by purchasing a school bus (notice our club name on the bus). The children who live in a very rural area of India will now be able to go to school year-round, even in the rainy season, because the bus will be there for them. The school will also be equipped with up-to-date washrooms. This project will bring much-needed relief to a generation of aspiring students thirsting for knowledge. It will surely transform their lives in more ways than we can imagine. A great team effort by the Rotary Clubs of Oshawa Parkwood, Whitby Sunrise, and Rotary Clubs in India. 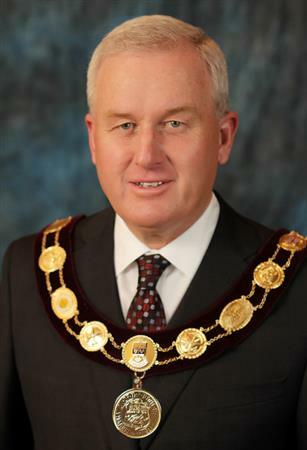 Mayor Don Mitchell delivered his annual address highlighting a number of the Town of Whitby’s major accomplishments in 2017, including the continued revitalization of both Downtowns, progress on active transportation and ongoing transformation of the Town as a destination. The Mayor also provided a snapshot of the Town’s 2018 priorities, including the redevelopment of Town Hall and creation of an Innovation District. The Town’s 2018 Budget Highlights provides additional details on the topics covered by the Mayor and can viewed at whitby.ca/budget. Rotary member Greg Frankson spoke about the theme of anti-racism by sharing some of his personal experiences in the community and he offered some points about the progress we’ve made to date as a society and where we still need to make additional progress to eliminate racial inequality. He also talked about the origins of March 21 and reflected upon the unfinished legacy of Dr. Martin Luther King Jr., who was assassinated in Memphis, Tennessee on April 4, 1968 – fifty years ago next month. On April 2nd the Sunrise Rotarians were at Absolute Equestrian Centre helping Horses Help Canada with their Durham Location Open House. The Rotary Club of Whitby Sunrise brings joy to a little girl with Cerebral Palsy. 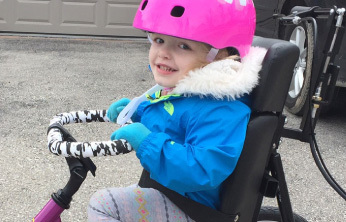 Through it’s Community Service initiative “Partnership in Service” The Rotary Club of Whitby Sunrise has put a big smile on this little girl’s face by contributing to the cost of an adapted bike. Check out this awesome Ribfest video! 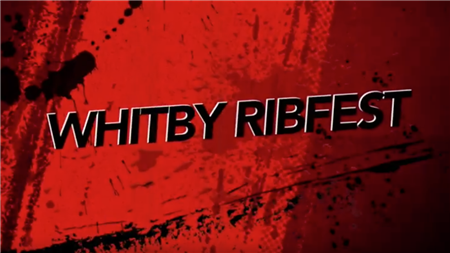 And mark your calendars, the 5th Annual Whitby Ribfest is July 7-9th, 2017. What do a group of volunteers do on a rainy Saturday morning in the spring and fall? What else but garbage pick. Yes, Rotary Sunrise Rotarians have adopted a portion of Hwy 12 north of #7 and south of Myrtle Rd. Each spring and fall they get out there, rain or shine, and clean up the gullies and grass. You can only imagine what they find! What does a 50 bed women's shelter need? Towels and Linen. 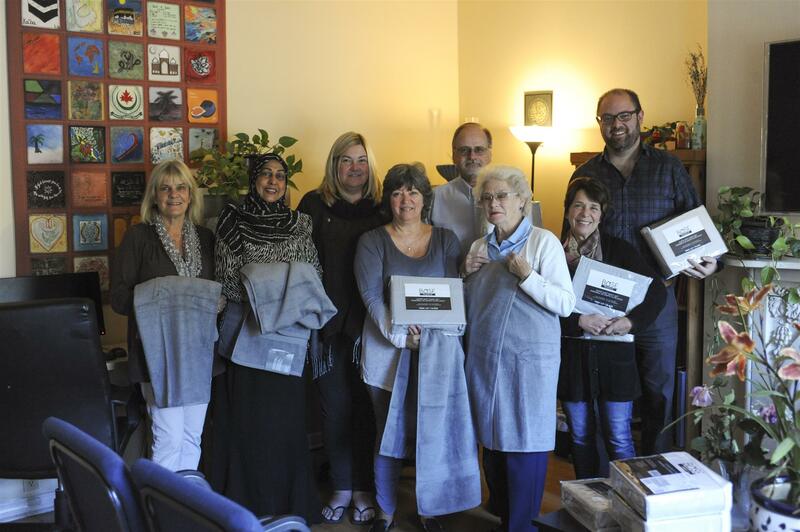 Rotary Whitby Sunrise was pleased to donate much needed towels and linen to a local women's shelter. Shown here are proud Rotarians making the give. 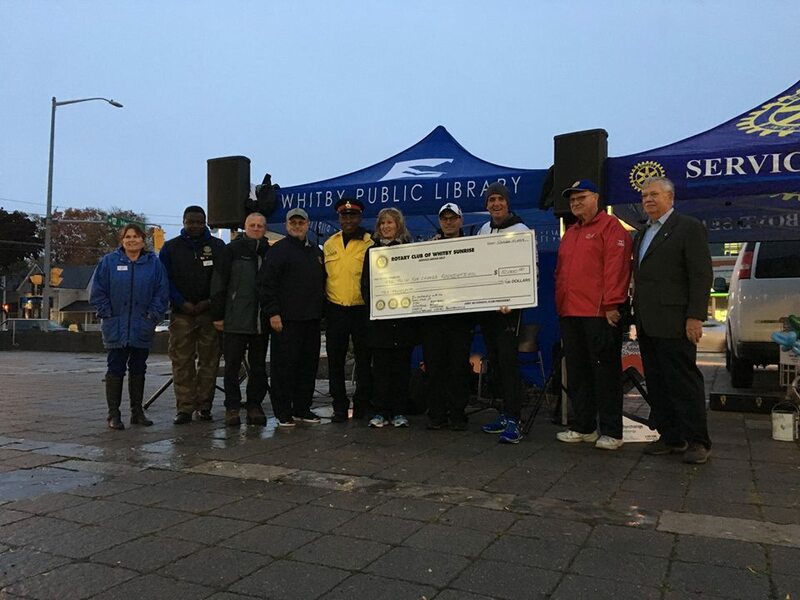 The Whitby Public Library was excited to participate in the Rotary Club of Whitby Sunrise’s community event "Push for a change" held on October 21, 2016. The Push for a Change is an initiative started by Joe Roberts, a former homeless youth turned successful business person, to help raise awareness of youth homelessness in Canada. Joe Roberts made his way through Durham Region stopping at Celebration Square in Whitby for a well attended and spirited community gathering. When Melie Genicot returned to Belgium on August 5th, 2016, she took back much more than she left with. 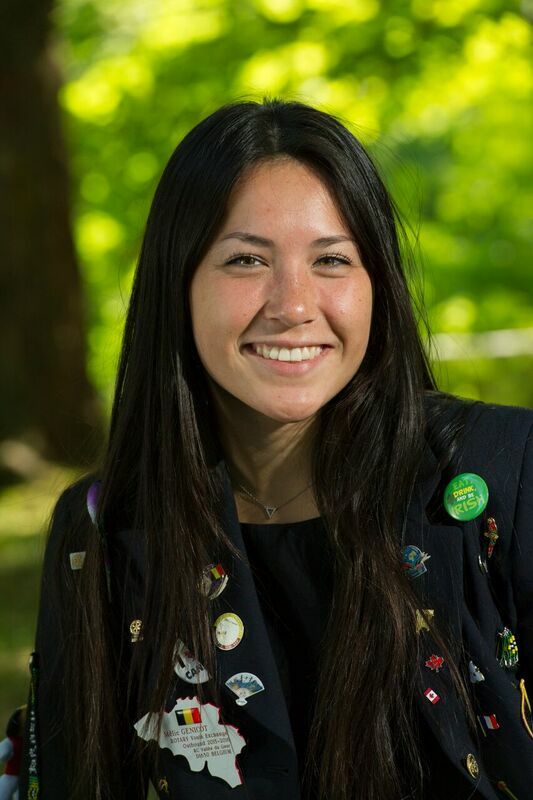 The 18 year old spent a year immersed in Canadian culture as part of the Rotary Club of Whitby Sunrise’s youth exchange program. She now speaks English fluently, has formed lifelong friendships, and learned life lessons she never expected when she stepped off the plane last August. “It’s the best experience you could have in life to learn about yourself and learn about other people,” she said, reflecting on the past year during her last few days in Canada. 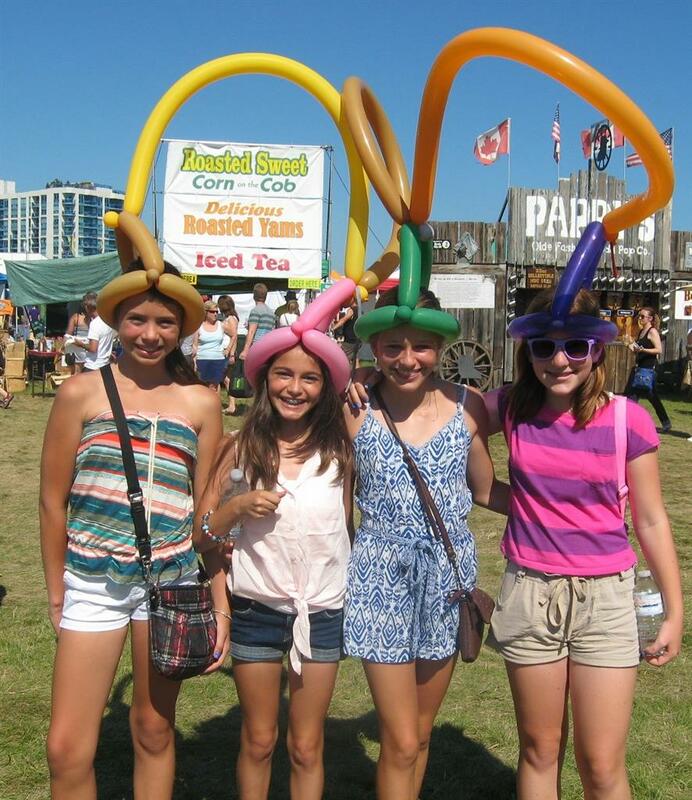 Attendees of Whitby Ribfest received more than tasty treats on Saturday, July 9. They watched as the The Rotary Club of Whitby Sunrise renewed its commitment to Durham’s kids by presenting a $50,000 cheque to Grandview Children’s Foundation in support of Grandview’s urgently needed capital project. Grandview Children’s Centre has outgrown its building and it requires modern purpose-built rehabilitation space to serve the 8,200 children and families in need now. In May 2016, members of our club have gave an old house a new look! The Rowe House, the home of Whitby’s first mayor James Rowe, was built in 1856 at 1600 Charles St. It remained there until 1999 when it was set to be demolished. Concerned residents rallied to save the Rowe House when Judith Barker and the late Town of Whitby councillor Shirley Scott created the Whitby Heritage Community Association. Working with the developer they managed to acquire a piece of land from the Town of Whitby to move the historic home. The developer poured a new foundation and moved the house to its current location at 301 Front St. W.
As a tribute the Ms. Scott, at the suggestion of Councillors Derrick Gleed and Elizabeth Roy, (both great members of the club) the Rotary Club of Whitby Sunrise agreed to prepare, scrape and paint the house as a community service project on May 6. WhitbySunrise club member extraordinaire, Steve Rutledge takes pride in helping those who truly need it. His efforts dramatically affect the children of the tiny village of Hat Kham in Laos. 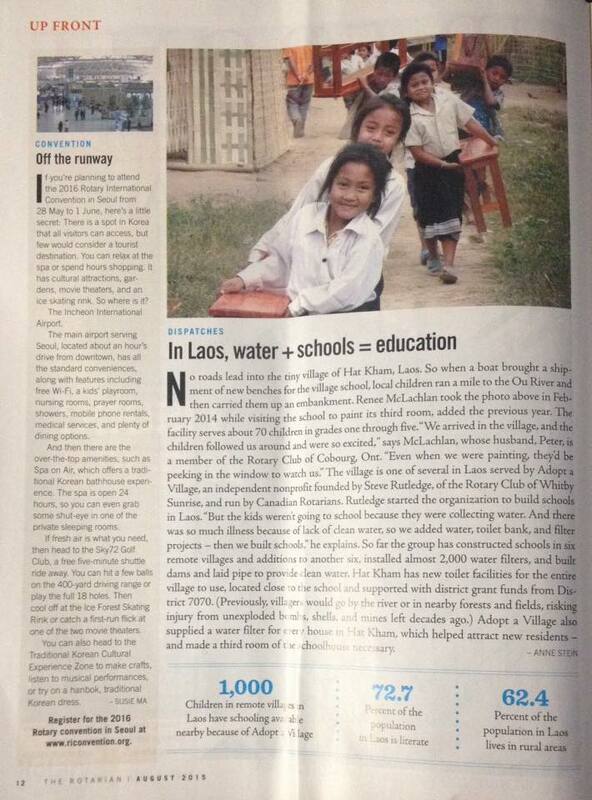 Although he needs no recognition, the story of how Steve founded the nonprofit organization call "Adopt a Village in Laos" and the impact it has made was highlighted in the August 2015 edition of the Rotarian magazine. We are very proud of our members, they give BIG, locally in our community, and internationally. Steve is certainly exceptional with his ability to give and care for others in a country where basic needs are the focus. In Laos, water + schools = education. In Laos 1,000 children in remote villages have schooling available because of Adopt a Village. 72.7% of the population in Laos is literate. 62.4% of the population in Laos lives in rural areas. The tiny village of Hat Kham now has clean water and a toilet bank - children no longer have to spend their day sick and working to collect water. Because of Steve and Adopt a Village in Laos, they can spend their day learning, growing and giving more to the world then they ever would have without the efforts of Rotarian Steve Rutledge - Great work Steve! Proud to have you as a member of our club. The Whitby Sunrise Rotary Restorations Team has been assembled! We will be ripping out the damaged floor at Vicki Kemp's restaurant, 3 Steps Up located at 605 Brock Street North on Saturday, March 14th @ 3:00 PM. Seal doorways to kitchen to prevent dust entering cooking area. Remove and dispose of water damaged floor, molding and underlay. Clean floor with hot water and cleanser. Move furniture back into position. We expect about 3 to 4 hours of effort. If you have some time, please stop in. Press release - Whitby, ON (March 2, 2015) As part of a National Immunization Day aimed at vaccinating over 172 million children under the age of 5 across India, a Whitby couple joined a Rotary International team of volunteers from Canada, Switzerland, Australia and the United States to give Polio vaccinations in rural India in late February. This team and others of international volunteers from Japan, Britain, Belgium and France joined local volunteers and health officials to carry out the two day national campaign. Rotary Club of Whitby Sunrise member, Brian Thompson (2014/2015 District 7070 Governor), and his wife, Karen, traveled with their team to Nuh, Haryana, India about 70 km from Delhi. Nuh is a predominately Muslim community which endures ongoing poverty and lack of basic public services. The vaccination is administered by two simple drops on the tongue. Someone with no medical experience can provide this form of immunization. 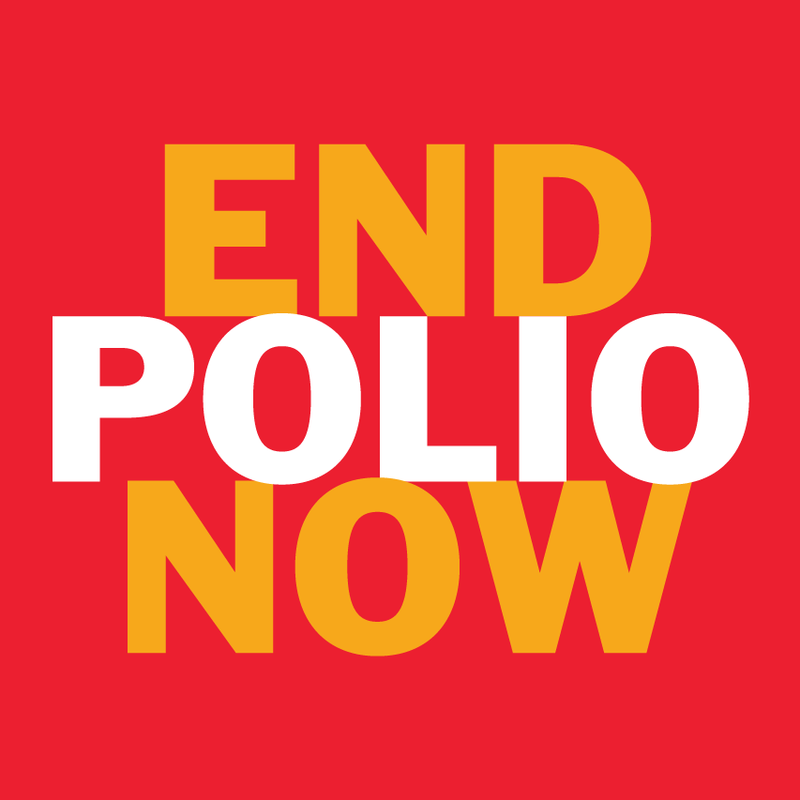 This unskilled form of vaccination is crucial to keeping polio at bay because so many more people can volunteer to administer it. 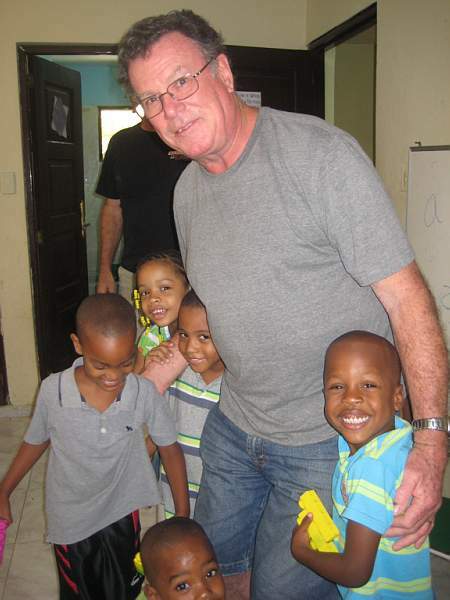 During one of the coldest weeks of the Winter of 2014-15, two Rotarians, Tom Fitzsimmons and Mark Wittgen, from the Whitby Rotary Sunrise Club traveled to Consuelo, Dominican Republic to assist Bob "Roberto" Jarvest. This was not your typical fun in the sun vacation. They spent the week, distributing clothing, installing and repairing swing sets. Distributing water filters for the next crew traveling down which includes Diane Allen, Jenn Fry, Peter Gorham and Kate Piggott-Babony with the remainder of the instructions provided later in March by Linda Raney. During his seven days in the sun, Mark kept a journal of his activities and experiences in the Dominican Republic. Every month, on the second Thursday, the Rotary Sunrise crew volunteers at Durham Outlook For The Needy - St Vincent Pallotti's Soup Kitchen. 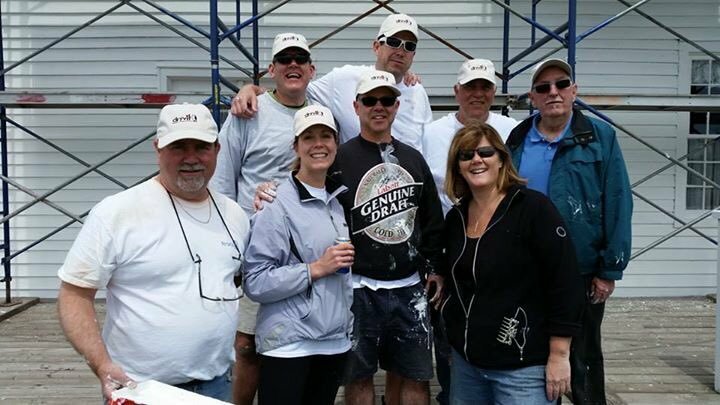 The crew consists of Rotarians, spouses, family, friends and colleagues. All come together with one common goal to create a healthy, tasty meal for our members of our community who are less fortunate. Thursday February 12th, 2015 was another successful dinner service at St. Vincent Pallotti's Kitchen, an extra special Valentine's Day one! We have such amazing, talented and dedicated volunteers that prepared a fabulous spaghetti & homemade meatball dinner for the guests at St. Vincent's. With fresh garlic bread too! Thank you to those who take the time out of your day to serve our community. And a BIG Thank You to everyone who donated their time, ovens and decorations. Special thanks to Petite Thuet bakery for the fresh bread! 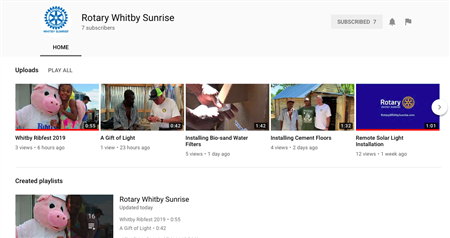 The Rotary Club of Whitby Sunrise has been working in the Dominican Republic since the hurricane devastated the island in September 1998. The first trip to the town of Consuelo in October 1998 was by two Rotarians, Blair Buchanan and Bob Jarvest together with chain saws and generators. Since then, many members have visited and worked on various projects in Consuelo and the bateys (small communities) located in the sugar cane fields which surround Consuelo. Thursday October 9th, 2014 was another successful dinner service at St. Vincent Pallotti's Kitchen, an extra special Thanksgiving one! We have such amazing, talented and dedicated volunteers that prepared a fabulous Thanksgiving dinner for the guests at St. Vincent's tonight. With roast turkey, potatoes, homemade stuffing, squash and apple soup and all the trimmings. Thank you to those who take the time out of your day to serve our community. And a BIG Thank You to everyone who donated their time, ovens and decorations. Special thanks to Stroud's Farm for donating all the vegetables! On February 7, 2014, Rotarians from Whitby escaped the frigid grip of winter and flew to the Dominican Republic for an unforgettable week of experiences. This group of twenty individuals included members from both of the Whitby Rotary Clubs as well as a number of spouses and friends. This trip offered the opportunity to combine the volunteer efforts of distributing food, clothing and school supplies with a two day hike to the peak of the tallest mountain on the island, Pico Duarte. On the second Thursday of every month all year long, Team Leader Jane Thuet rallies the volunteers at St. Vincent Pallotti's Kitchen, 51 King St. E. in downtown Oshawa. 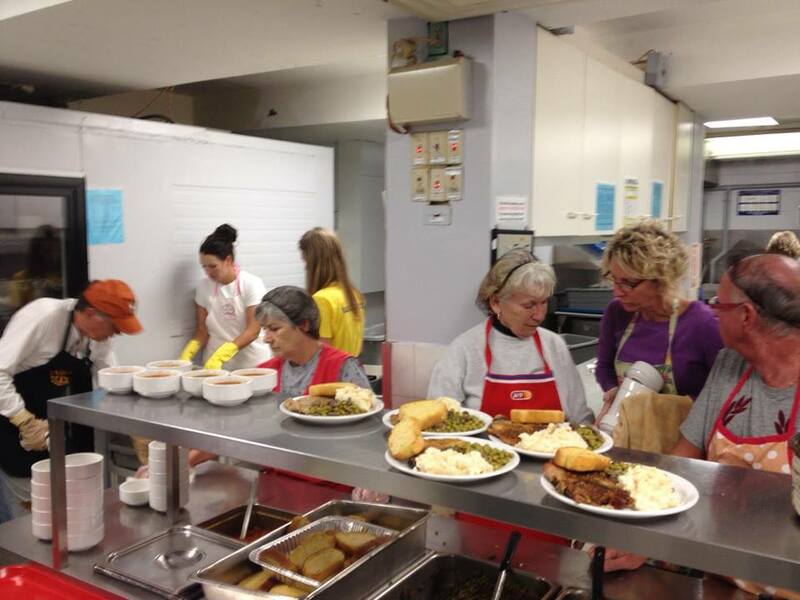 St. Vincent's provides low-cost meals to people in need. The morning crew arrives early to set up, cook and prepare the dining area for the evening meal for between 140-200 people. All of the meals are made from scratch with donations from local businesses and Feed the Need Durham. Starting at 3pm the afternoon crew arrives to serve meals to the Kitchen's patrons. 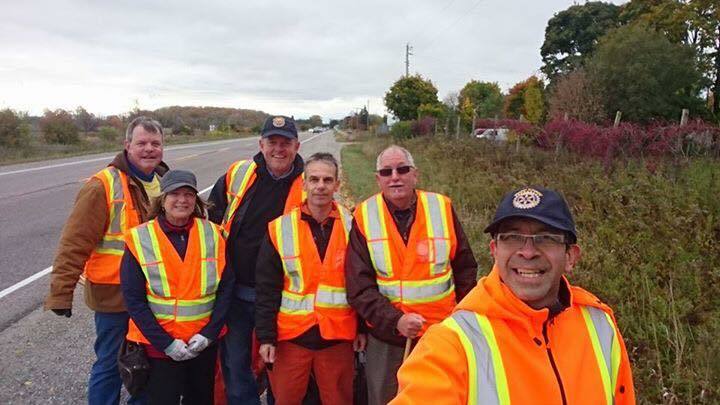 Much fellowship is created within the Rotary Club of Whitby Sunrise and all the many Friends of Rotary who are always willing to lend a helping hand. Water Filters Bring Smiles to Families and Make Steve a Bit Tipsy. Steve Rutledge - member of The Rotary Club of Whitby Sunrise - sends his thanks. Below is an edited version of an email he sent while in Laos. "We, are pleased to present photos of Lao families member receiving a water filter system, in our ongoing distribution (and hygiene training) in the northern region of Luang Prabang province in Laos. In this round we distributed 275 systems, with a total of 525 for the year. THANK YOU! The three water filter photos below are as a result of the District Matching Grant. We were able to purchase 13 water filter systems and will begin the main water project in Phonesavanh in the coming weeks. 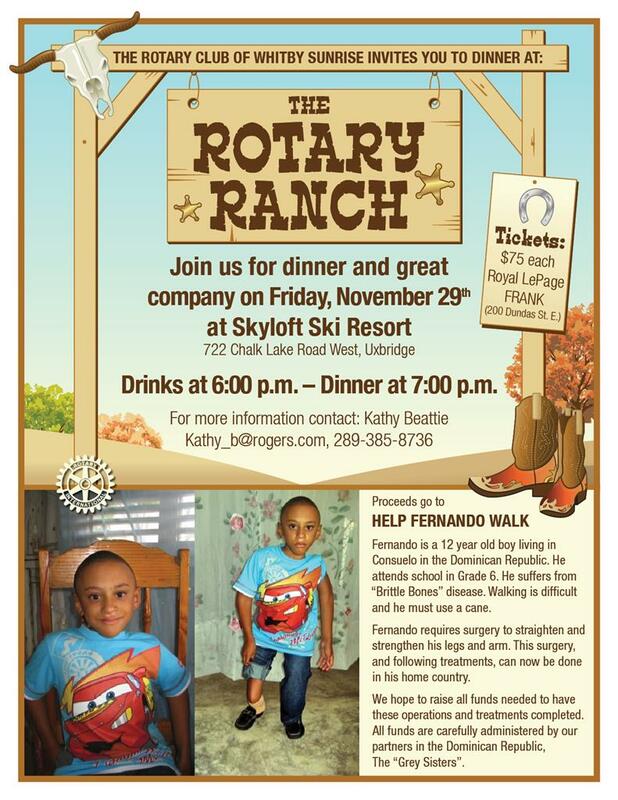 Dinner at The Rotary Ranch - Save The Date! What do Aquaponics, Rice Hullers, Solar Power, Schools & Thailand Have in Common? 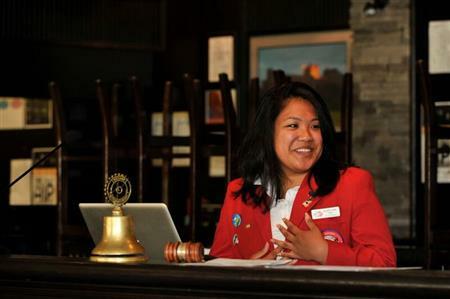 Rotarian George Punyaprateep, That's what! George is a dedicated philanthropist whose drive never ceases to amaze us. His projects in Thailand, while centred on education, have a double function....to feed the students. His latest project involves aquaponics, basically a marriage of aquaculture and hyrdoponics to assist the development of students and offer a new farming alternative to the villages throughout northern Thailand. 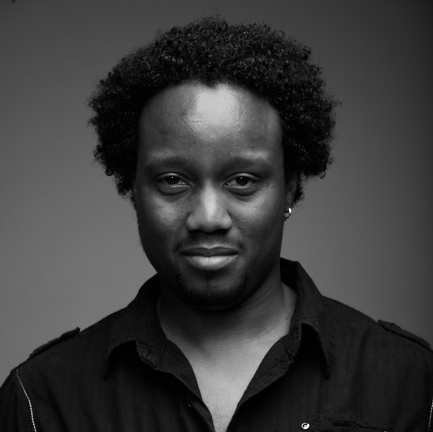 Follow the link to learn a little more about his amazing projects. During a recent meeting, we were honoured with the presence of Victoria Kehoe from Distress Centre Durham. 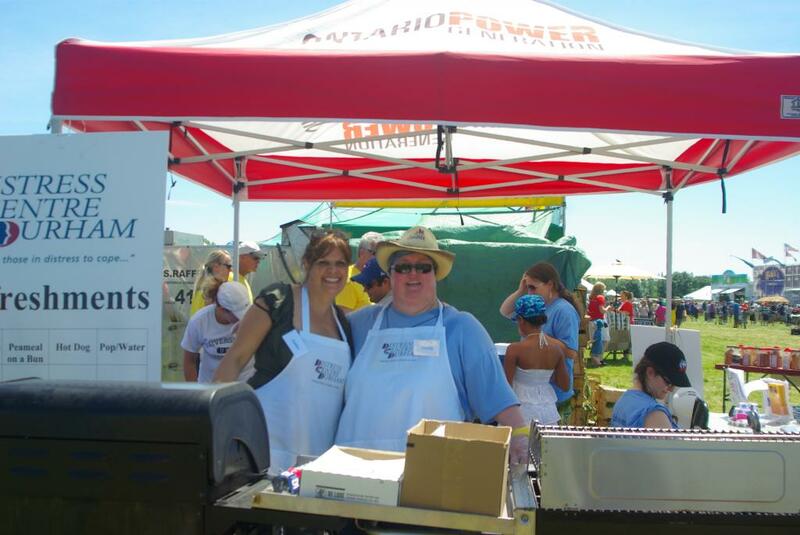 During our summer Ribfest, their amazing team cooked and served hotdogs, hamburgers, back bacon and other goodies to the Ribfest guests. As a result of their hard work, Victoria was presented with a cheque for the proceeds. Victoria taught us about their critical programs including crisis management and suicide prevention services. 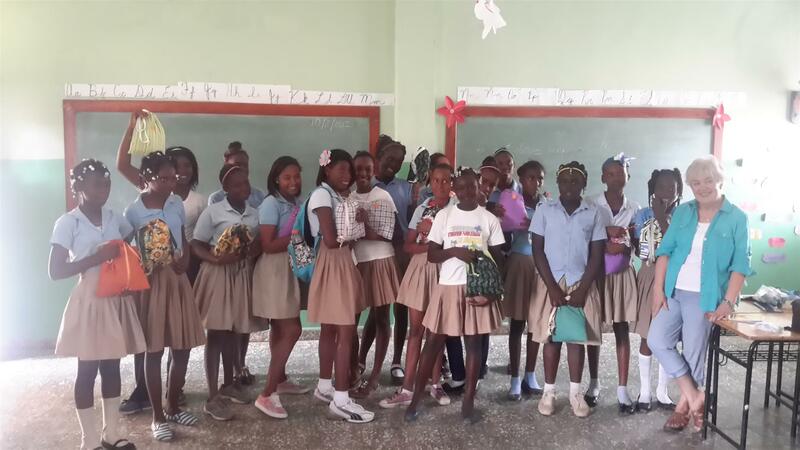 Take a look at the fantastic work being done in the Dominican Republic by our very own Bob Jarvest and his amazing wife Margaret, along with a host of Whitby Sunrise Rotarians. Special Thanks to Rob Morton for providing content to this update. For more, click on the link below. Dianne McKenzie, Executive Director visited our Club this week to receive a cheque for the proceeds from the Dunk Tank they operated at the Whitby Rotary Ribfest. Here is what Dianne had to say. 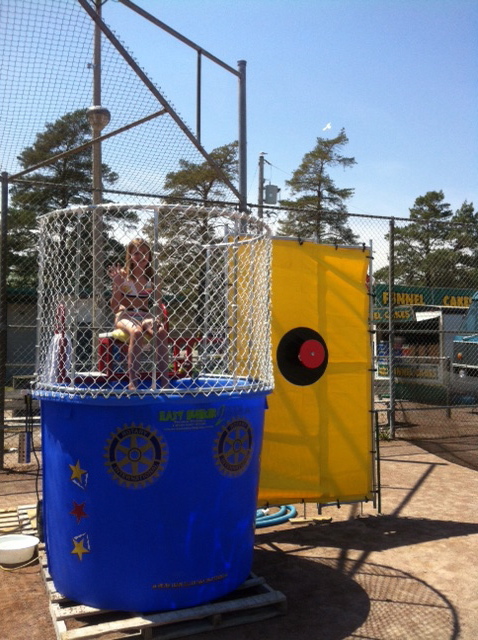 Brooklin Spring Fair Dunk Tank! Our annual dunk tank up and running at the 2013 Spring Fair! 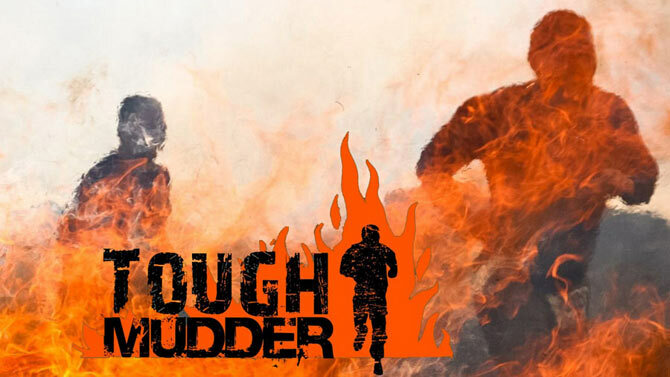 Click on our Fundraising page for additional details on how we have fun raising money in and for our community. Whitby Ribfest is back for 2013! 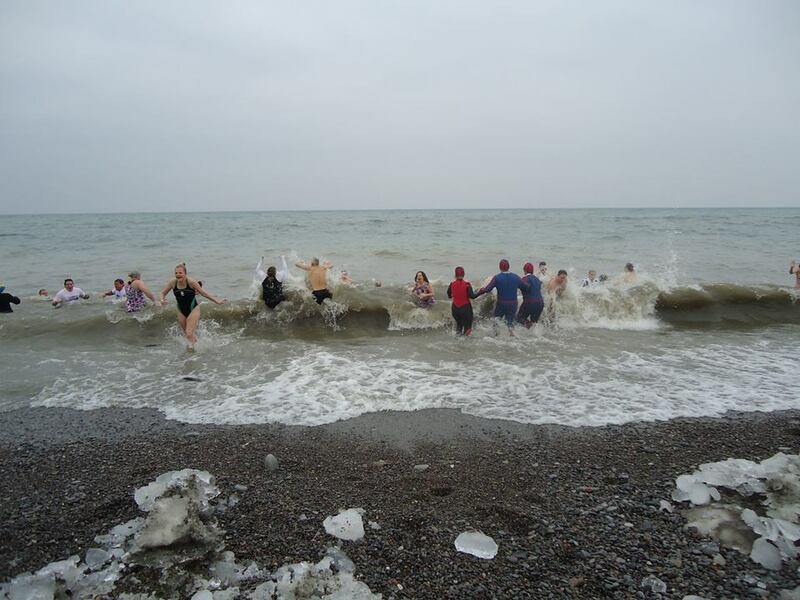 History......last year December 28th was a chilly but sunny Saturday on the shore of Lake Ontario, for the second annual Polar Plunge. 70 people, young and old, prepared inside Heydenshore Pavilion to brave the wavy waters. Under the watchful eye of Med-vents we headed down to the beach and readied ourselves physically and mentally for the Polar Plunge. The winter of 2013-14 proved to be one of the coldest in the recent past and created a water temperature cooler than last year's Plunge. The waves were rolling in as the horn sounded for the Plunge to begin. After the Plunge the smiling and shivering plungers enjoyed Chilli Dogs and warm beverages prepared by the amazing Rotary Sunrise Event Crew. 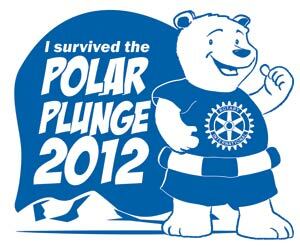 The monies raised at the Polar Plunge will help the Rotary Club of Whitby Sunrise with local community projects in Whitby and Durham Region. See you on December 27th 2014! Join us and check something off your bucket list! Click the menu item to the left to register. June 19th 2014 was a special day at Windreach Farm. They celebrated 25 years of giving to the community. Many of Windreach Farm supporters gathered for the celebrations and the Rotary Club of Whitby Sunrise was there to celebrate with them. 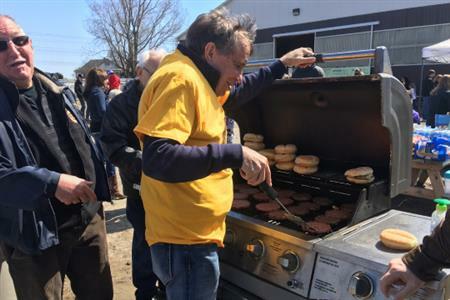 It's fundraising events like our annual Ribfest in July and Savour the Flavour in February that give us the ability to help others in a big way. Watch this video to see how valuable Windreach Farm is to the community and thank you to everyone for supporting us so we can give more where it's needed. 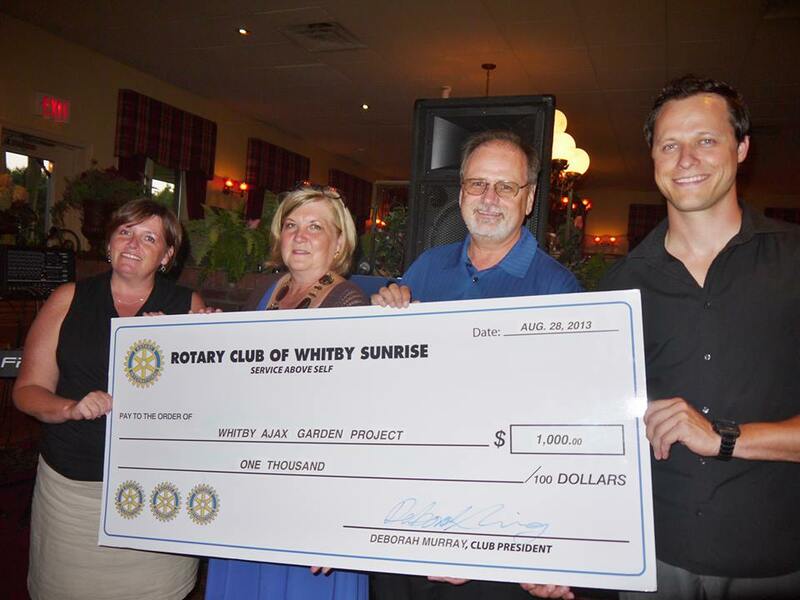 The Rotary Club of Whitby Sunrise gives big in our community. Many organizations benefit from the fundraising activities carried out by the dedicated members of this club. 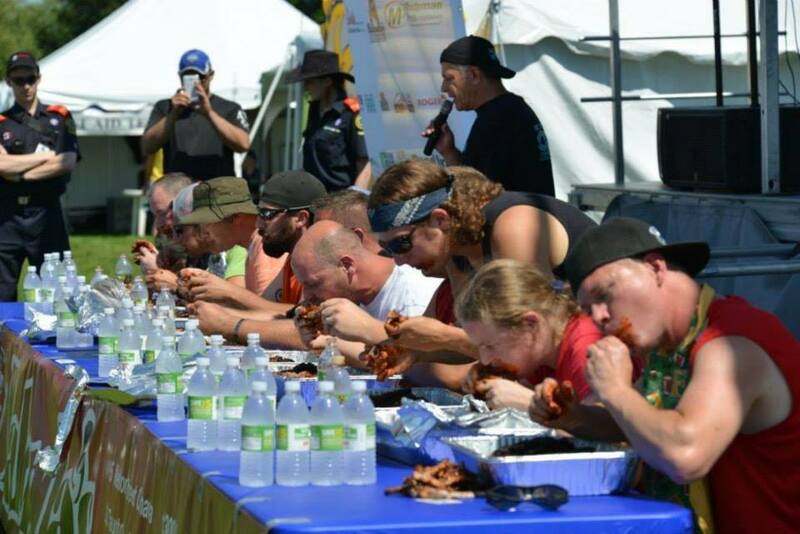 The three top fundraisers include the annual Ribfest held the second weekend every July, Savour the Flavour held before Valentines Day in February, and Charity Bingo at the Delta Bingo hall. The Rotary Club of Whitby Sunrise would like to thank everyone who had a part of making our second annual Ribfest a huge success. We could not have done it without our amazing sponsors, dedicated volunteers and all those who joined us to enjoy the sunshine and fun at Victoria Fields. Early calculations are that 50,000 people walked through the gates between Friday July 12 and Sunday July 14. Check out the Fundraising page for details and photos from the amazing weekend!